Here is a modern tribute to Forsyth’s Motor Bus Services. The company was set up by Thomas Forsyth and his wife Margaret Dickson in 1922, with a fleet of six buses. By 1925-6, he had twelve driver and conductor licenses. The service was run from Plean-Bannockburn-St Ninians-Stirling. He owned a fleet of vehicles and charabancs, and ran trips to the Trossachs, Bridge of Allan Games, and various excursions to places such as Aberdour. His wife undertook all of the applications for licenses, and probably ran the business side of the firm. Forsyth’s Motor Tours was featured in the Motor Transport Journal of 1925. Forsyth commissioned his vehicles from Kinross’s Coach Works, Stirling and from Albion Motors, Glasgow. 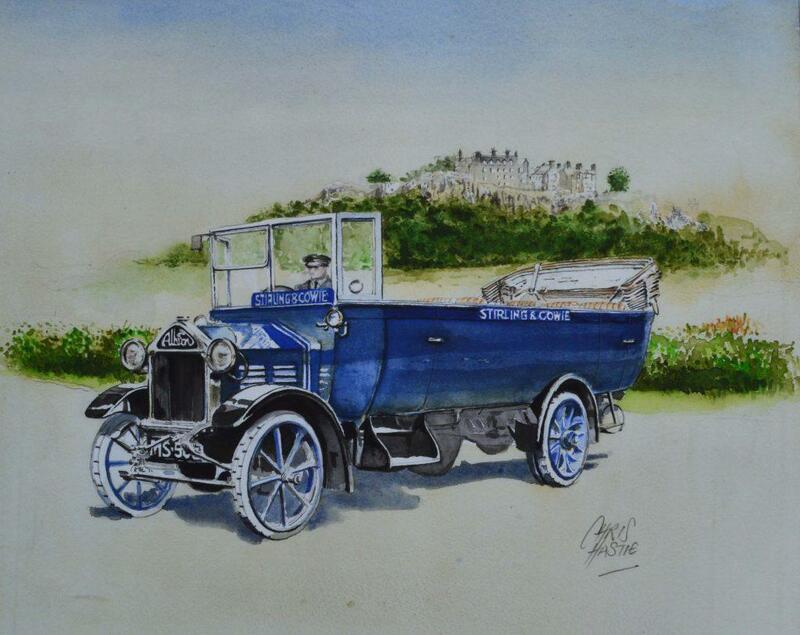 This splendid Albion vehicle is depicted below the Castle by Stirling – based artist Chris Hastie, who was commissioned to do the work by Forsyth family members. A giclée print of the work is a recent gift to the collections of the Stirling Smith Art Gallery and Museum. The work will also be on show at Falleninch Farm in the Forth Valley Open Studios season, 8 – 18 June, where copies of the print can be purchased. The art work was created with the help of old photographs, a splendid way of commemorating a family business. wow, this was so interesting to read, thank you for sharing this post.